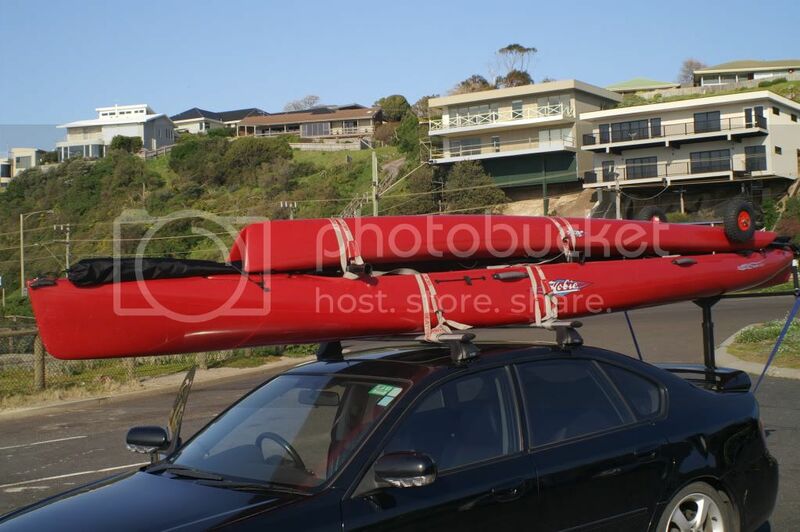 Hobie Forums • View topic - 2010/11 Subaru Outback suggestions? Post subject: 2010/11 Subaru Outback suggestions? Any of you out there got a late model outback that you use to roof top an AI? If so what do you use bars etc? Some genius at s uh baru decided to create some sort of integrated roof bar system that means that the bar separation front to back is only 30" which i'm assuming is too close? Correct me if I'm wrong. Post subject: Re: 2010/11 Subaru Outback suggestions? I have a Liberty; and a TI. I have a Thule goal post. The goal post is inserted into my tow bar. I have attached a photo. I really want to stick with Thule roof equipment as I have a significant investment in their stuff, I also use their retractable extension bar that makes it easy to load by myself. Wow I cant believe you can load a tandem on your own. Subaru recommend purchasing their basket and mount bars onto that giving a 40" spread which seems like a bit of a lash up to me. I really dont want to fabricate something but it looks like thats what I may end up doing. JJ, I've got a Forester with a 40" spread between the racks, but I can't see that even a 30" spread would be that much of a problem. If the boat is well centred (fore and aft) and tied down securely, where is it going to go? I have enough clearance to carry my AI inverted, which adds a bit of security, as any forward motion of the boat would be limited by the rear crossbar encountering the rear roof rack. If you really want to add some security, you can loop a strap around each roof rack and the corresponding crossbar. Failing that, Paul's goal post seems like a viable alternative, provided you have a tow hitch and don't mind the cost. I have a 2010 Outback with that useless roof rack. I use the Thule Slipstream to spread out the pads and to protect the back of the roof when loading. It is not ideal because the AI bounces around alot, it definetly feel overloaded. If I had it to over again I would go with a Goalpost. Hi dpstivers. I don't think this is the place for a full Subaru 2010 Outback review but on the whole is it a great car for an AI owner? I'm yet to purchase, my choice of station wagons are Volvo XC70 or the Outback. XC70 is +10K$ and its poor gas milage are what is really putting me off. I have been talking with Subaru HQ and they are saying that this new rack style is here to stay so its going to be up to people like you and I to figure it out. Subaru HQ's solution is to purchase one of their roof baskets and add the bars to that ...... this would give a 40" bar spread (rather than 30")which is about what I get with my current Jeep Liberty solution. Still, more connections (bars to basket-basket to Thule bars-bars to AI) means more movement maybe? Goal post is an option but if I want to take bikes as well I'm scuppered!! After many hours of research I decided to get the 2011 Outback with the useless (unless you want to carry a small case) integrated roof system. I had many an email conversation with Subaru America about what I could do to carry a 16' AI. One thing they did suggest was to purchase the heavy duty roof basket (exactly the same as the Yakima but Subaru is printed on the air deflector rather than Yakima) and mount my Thule roof bars on that. Takes the bar spread from a minute 30"up to the same as what I had on my Jeep 40". Here is the good news, Subaru are offering a $150 rebate to anyone with a 2010 or 2011 Outback. It gets better, all you have to do is provide the vehicle VIN and a scanned copy of your invoice from a Subaru dealer not matter what you paid for it. MSRP is $250, I got a deal from my local dealer for $210. Just received the payment from Subaru ten days after my claim for the full 150 so after tax I paid $80 for it. When you loom at the instructions that come with the basket there are a number of images of the basket with a kayak on top. My guess is Subaru understand that the roof system is a problem for people like us so this is their way of trying to make things right. Haven't put the AI on yet so I'll take pictures if anyone is interested. I just bought a 2011 Outback and would like to see a pic of your AI loaded on top of your Subaru. Thanks. what is the maximum weight that you can put on the roof? I want to know the maximum load I can put on the roof rack, lots of thanks. I have an older Subaru and looking to add kayak carrier for my new kayak found these folding bars, https://vaultcargo.com/subaru-forester- ... ross-bars/ but was wondering how they stand up to the thule ones. I check my local sporting goods and the thules are pretty expensive and really don't look too much different. Just want to make sure I have a set that looks like it will hold my Mirage. Thankfully the Australian versions of the Outback did not get the fancy roof rails until 2014. I had a 2010 outback until last winter when it got written off by a collision with a kangaroo (common occurrence here). When looking for a replacement I had to limit the choice to a max 2013 version so that the roof rails were the old style. Australia also has the advantage of getting the diesel version and that is still available with a manual transmission. Averaging US 36.3mpg (6.5l/100km) so far with 2013 model.